Americans' collective wealth hit a record $70.3 trillion in the first quarter of 2013, seemingly wiping out all the losses from the recession. 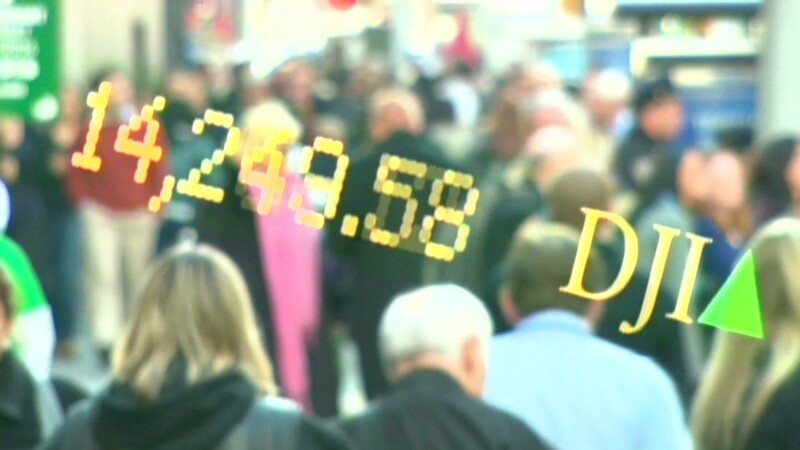 The previous high had been $68.1 trillion in the third quarter of 2007, according to the latest quarterly flow of funds report from the Federal Reserve, released Thursday. But there's a catch: These figures don't account for inflation. Household wealth is still $5.1 trillion, or 6.7%, below its peak if you factor in inflation. And it's 11% below its all-time record if you add in population growth as well, according to data crunched by Moody's Analytics. 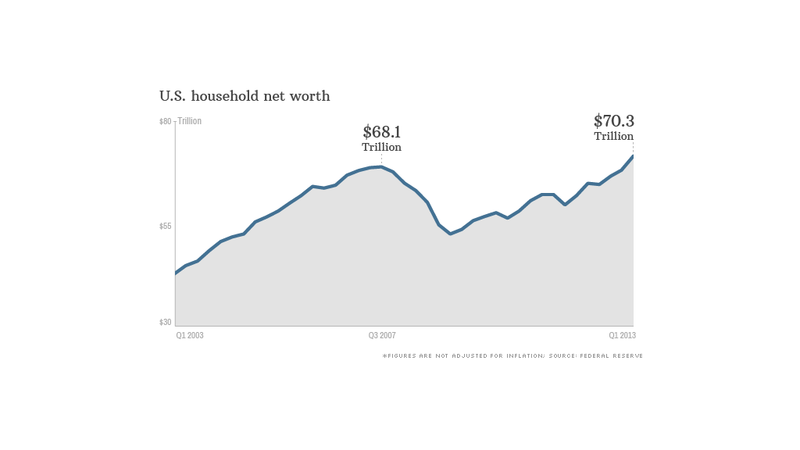 The stock market is fueling the surge in household net worth. The value of equities and mutual funds owned by Americans rose by $1.5 trillion in the first quarter, while the net worth of residential real estate increased about $784 billion. The gains, however, were not widespread. Those whose wealth is grounded in investments -- mainly richer folks -- have been more fortunate than others. The improvement in the nation's wealth is likely to continue for now, thanks to the ongoing surge in the stock market and the steady rise in home prices, said Scott Hoyt, senior director of consumer economics for Moody's Analytics. U.S. home prices posted their strongest gains since 2006, with prices on the S&P/Case-Shiller national index rising 10.2% in the first quarter, according to the latest report released last week. "Clearly, we are on a good trajectory," Hoyt said. While many rich families have already seen their wealth rebound, it will take years before the middle class regains what it lost, said Gus Faucher, a senior economist with PNC Financial Services. That's because middle class families' wealth is tied more to home prices. Housing values are on their way up, but they are still 26% below their peak. Average household wealth is less than two-thirds of the way back to pre-recession levels, according to Bill Emmons, an economist with the St. Louis Federal Reserve. "The gains will still be concentrated among high-income households," Faucher said. "It will take much, much longer for middle class households to catch up."